Call it tradition, call it extra work during the holiday season, or just call it a bore to read: that blasted Christmas letter and photo. For many families keeping touch with friends and family far away, the holiday letter and photo is a necessity (some might say a necessary evil) in letting as many people know the joys and sorrows of the past year in the most efficient manner. In addition to the annual letters come the accompanying family photo, sometimes featuring the entire family, other times featuring just the kids. Most of these tend to fall in one or two categories: “here we are in coordinating shirts” or “here we are on vacation.” More often than not, these come via the elaborate photo cards that make them even more pristine. I am not by any means criticizing these, as I love seeing everyone, how they’ve changed, and what they’ve done over the past year. It is a joy having friends from all over the globe. However, once I’ve waded through the sixth full-page letter of vacations, new babies, graduations, moves, and job changes, I wonder if I’m the only one who actually takes time to read these things. Does anyone read or look at mine? As a bit of a storyteller by nature and occupation, this is a genuine concern. After all, happy feedback from my readers (even if it is just friends and family) to a writer is like a round of applause for an actor. Even before my oldest daughter was born, I wanted to send photos and notes that people would not only be happy to receive, but actually look forward to getting. Plus, I wanted to send something that wouldn’t end up on the cover of an “awkward photos” holiday special. Expedition party for the great airbourne caribou migration. It all started when my husband and I were living with three pets in an itty-bitty farmhouse. I wasn’t particularly happy with my appearance that year, so I decided to draw our photo… Manga style. I didn’t realize how much people loved this until I starting getting calls and comments from friends and family, some of which I hadn’t heard from in a while other than via the annual Christmas card. My geeky lifestyle choice actually brought people closer. 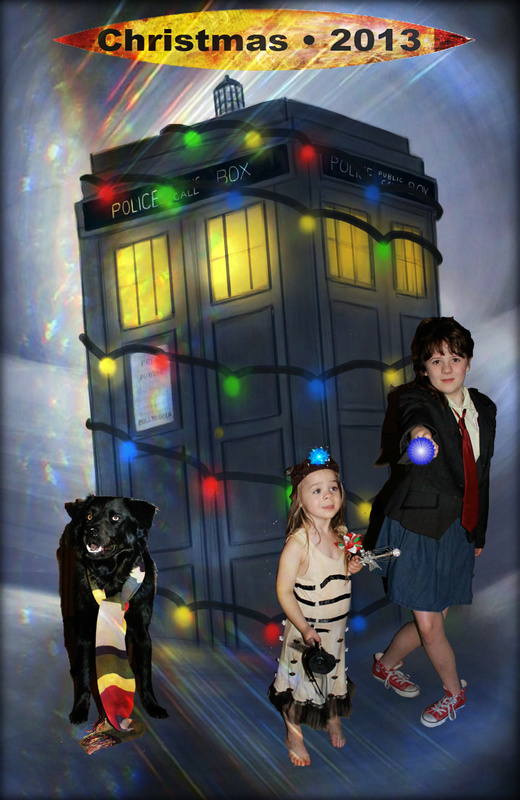 Since then, I’ve turned our family letter and Christmas photo into a creative challenge. 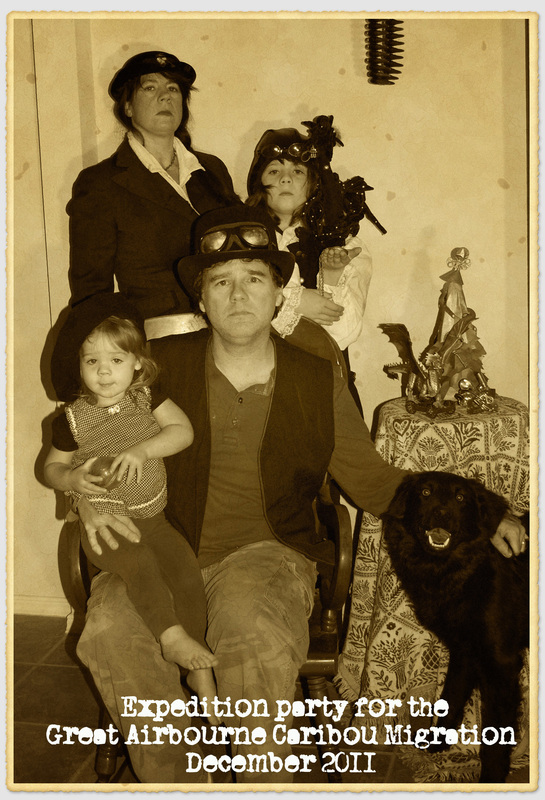 We’ve been everything from a pirate crew on Pirates of the Caribbean’s “Wicked Wench” to a steampunk expedition on a hunt for the elusive “flying caribou.” We’ve been transformed into The Simpsons, The Osbournes, and an American Gothic portrait (heavy on the “Goth”). 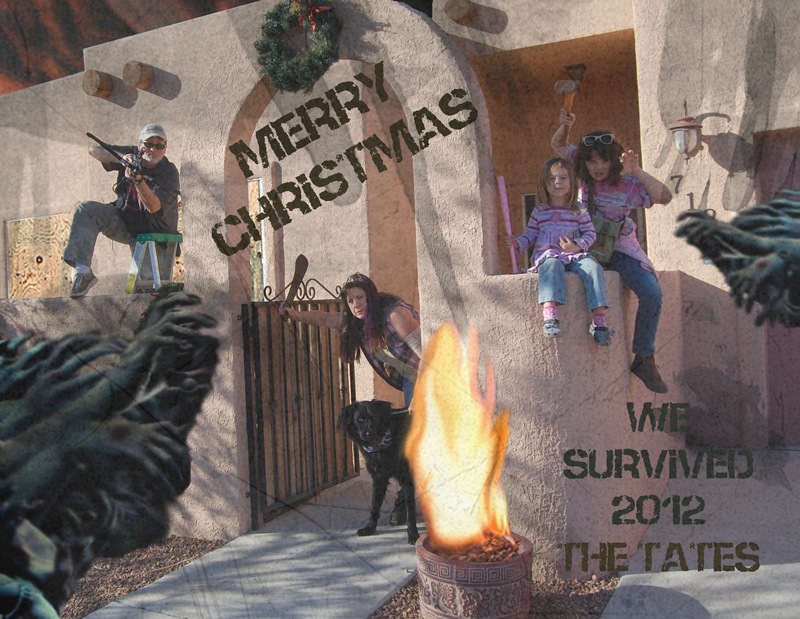 The 2012 “Zombie Apocalypse Survivor” photo and letter was by far a family favorite, as it coincided nicely with the multiple “world-ending” predictions that year. I still don’t think I’ll ever top that one. This year, everything in the geekosphere seems to be about Doctor Who, so who are we to ignore this trend? Not us, that’s for sure. These projects have given the entire family a way to be silly and creative together, and have also been a way to share our year in a way that will bring laughter and smiles to all those we miss dearly. This may seem like just another chore added to a busy schedule, but if keeping in touch is so important, why not have fun doing it? After all, isn’t that zest for fun and life one of the best parts of being a nerd, especially during the holidays? 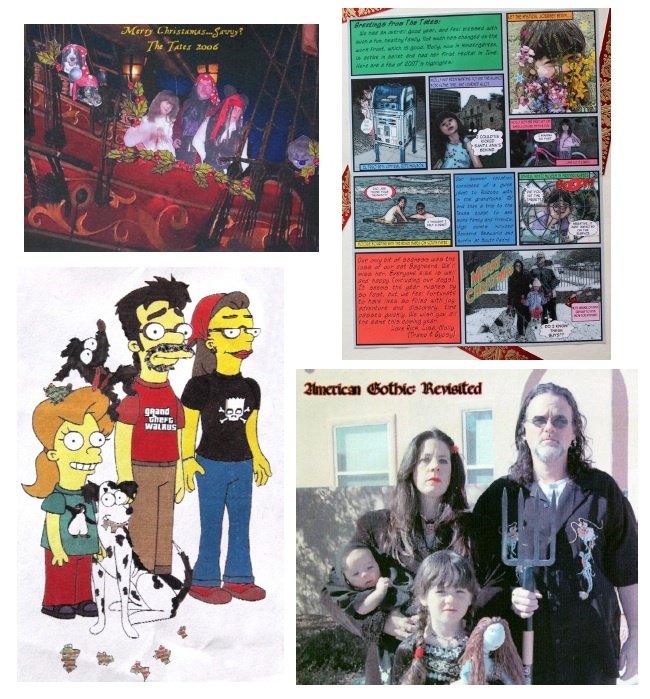 Clockwise from top left: Pirates of the Caribbean, a comic book Christmas letter, American GOTHic, and our family Simpsons style.